Looking to take your collectible card habit beyond dead trees? Your iPad has access to digital editions of some of the longest-running collectible card games (CCGs) in existence – and entry is free! Card games require careful planning and strategic thinking, but the experience can be addictive, rewarding and is even better with a few friends. Try your hand at these three shining examples without paying a penny. The granddaddy of all CCGs, Magic: The Gathering has been around for 20 years, and it’s still going strong. 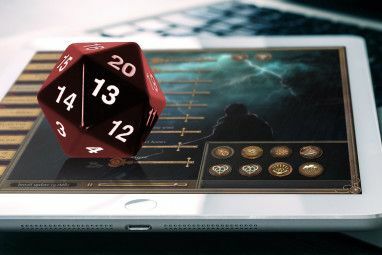 The iOS adaptation is a unique take on digital card games, and provides a surprising amount of variety. The game is free to download, and you can play through the first campaign stage before you have to shell out $10 for the full game. Once you’ve done that, you get access to the full range of campaign stages, more decks, and online play. You can also pay another couple bucks for deck slots that you can customize, which allows you to build your own decks. 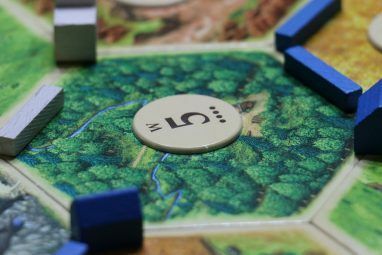 When you first start the game, you’ll play through a tutorial that includes a number of games against computer opponents that aim to teach you about specific game mechanics—spells, activated powers, and instants, for example. Once you’ve gotten through the tutorial, you can take a shot at campaign mode, in which you play through a story; each event in the story requires that you defeat a computer-controlled opponent. Of course, you can also play the more traditional format in which you face off against opponents online. You can use a pre-constructed deck or build your own, or compete in a sealed-format event, in which you build a deck from a random assortment of cards and play through a tournament with other players. If you’re into Magic, the $10–$20 you’ll spend on this game will likely be well worth it. If you’re new the game, the free tutorial and first act will give you a taste before deciding if you want to invest. It’s a bit more limited than playing with the thousands of cards that are available in the traditional format, but the portability and ease with which you can play a quick game add a lot to the value. StoneBlade Entertainment worked with Richard Garfield, the creator of Magic: the Gathering, to develop SolForge, an electronic-only card game. The game was designed specifically for play on phones and tablets, and includes some cool mechanics that wouldn’t be possible playing with traditional cards. After playing through a tutorial, you can build a deck, start challenging opponents in online play, or practice against a bot. You can also take part in constructed (standard) or sealed-format tournaments as well. A campaign mode is planned, but hasn’t yet been released. SolForge is free to play, and if you play regularly, you can actually accumulate a solid collection of cards without spending any money. You get a pack for signing in each day, and packs and in-game currency (silver) for playing your first three online games of the day. A second set was recently released, and it adds a lot of variety and new competitive deck styles to the game. Of course, you can also buy packs to add cards to your collection by paying real money for in-game gold. Some items can only be purchased with gold, encouraging you to invest some money in the game. I’ve found that an occasional purchase is warranted, but that you can build some really fun decks with the cards you get in the starter decks and free packs. When you open an account, you begin with two starter decks. You can unlock other starters for $4.99 each, or you can just play the game and accumulate awards to to start building your own. In the time that I’ve had this game, I’ve unlocked all of the starters and paid for gold two or three times, and I have found it more than worth the financial and time investment. Unfortunately SolForge is only available for iOS at the moment, though there is a lot of talk about an Android version being released in “early 2014”. An older game by StoneBlade, Ascension has made the transition from in-person card game to electronic very well. It’s unlike Magic and SolForge in that you don’t open packs to collect cards, but it’s so fun that I thought it should get a mention here anyway. In Ascension, you don’t build your deck before you play the game — you actually build your deck during the game. There’s a shared central deck of cards, and each player has the opportunity to acquire some of those cards for their deck each turn. Instead of buying packs to add cards to this central deck, you simply buy sets of cards. There are two full, standalone sets; two smaller expansion sets; and four promo packs that consist of a small number of cards. The expansions range from $2.99 to $3.99 and the promo packs cost $0.99. Ascension doesn’t have any built-in support for tournament play, but you can play matches with one to three other people online. 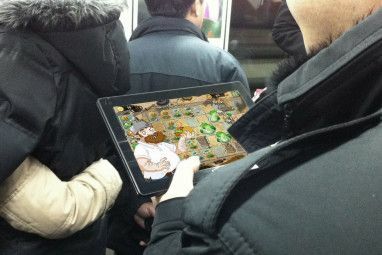 It’s also easy to play with another person by passing your iPad back and forth (I actually do this quite regularly). And, of course, you can play against the computer. If you’re looking for tournament play, you can sometimes find tournaments that are organised by Stoneblade, in which you report your scores via email. Whether you’re an expert or totally new to CCGs, these three will provide hours and hours of entertainment. We’ve featured Hearthstone Blizzard's Hearthstone Free-to-Play Card Game - Is It Worth Playing? Blizzard's Hearthstone Free-to-Play Card Game - Is It Worth Playing? 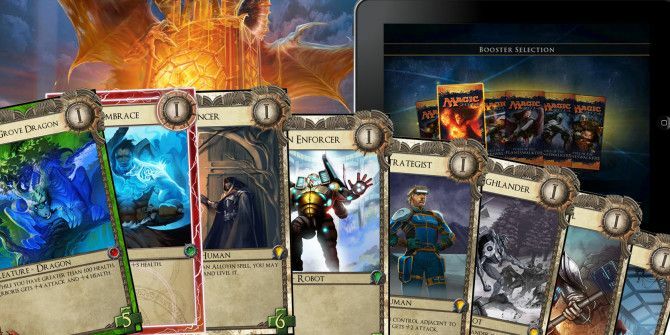 A free-to-play collectable card game doesn't sound like something you'd expect to see from Blizzard, but it's surprisingly fun and addicting Read More , BattleForge, and Summoner Wars before, and between these six games, you’ll be sure to find something you like. Give one a shot and see what you think—you might be surprised at how you get hooked! What do you think about iOS CCGs? Have you tried any of these? What did you think? Are there others that you recommend? Image credit: Kyle Gese via Wikimedia Commons. 9 iMessage Games You Can Play With Your Friends$7 for a Calendar App? Is Calendars 5 Really Worth It? I think the iOS CCGs are going to need to up their game now Hearthstone is out. Most have an interface that's not even in the same stadium. Sounds like it's definitely something that I should check out! Maybe I'll do a write-up on it in the near future. Haha—I've heard a few other people say the same thing. I'm continually impressed at Hearthstone's die-hard following. my old time favorite is Sanctum (https://www.playsanctum.net/) I spend 5-10 hours a week playing this classic. That's one I've never heard of—I just skimmed the site, and it sounds pretty interesting. Might have to check it out. Thanks for commenting! Glad you like it! I learned to play it in person before I discovered that it was available on iPad, and I really love it. Unfortunately, I don't know as much about CCGs on Android. However, you can get Magic 2014. I believe it's best played on a tablet, though, as it's not optimised for phone screens. SolForge is in closed beta for Android, so you could potentially get into that when it goes into open beta, which I believe is supposed to happen sometime in the very near future. A number of people have suggestions here: http://www.reddit.com/r/AndroidGaming/comments/1rgzbi/recommendations_for_a_ccg_for_android_please/ I'd recommend giving some of the ones listed there a try. Take a look around and see which ones interest you. If you find something awesome, let us know! I'd love to branch into CCGs on Android as well. Thanks for reading! I've always wanted to know if there are any (pretty or decent looking) collectible card game for Android. Suggestions?